Should sync on either DeSmuME 0.9.9/10/11. Decompiler and Bus Timing off. Still a few things left to try and improve. 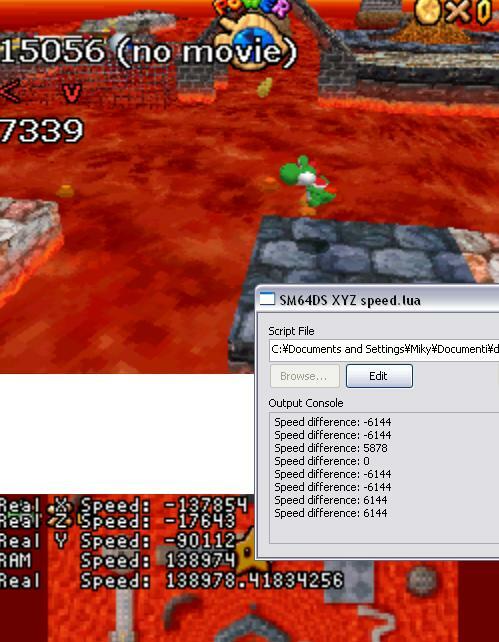 Works in both USA and JPN versions, draws XYZ position/spawn, horizontal speed, calculated speed which should be a bit more accurate than the RAM one, and prints RNG/speed changes depending on which function you comment-out in the code (defaults to RNG commented out). #23982940676404891 - for Brave Fencer Musashi, draws char’s XYZ and spawn point XYZ on the screen. #23424827930886380 - Tenchu: Stealth Assassins WiP. Echigoya dead at 8425 (8f saved), synced. Saved 4f on Katanal by buffering the input combo for the last hit. Saved 4f on Echigoya by changing the Up+Select dash+dashjump (roof exit) to manipulate the RNG (which saved 2f on the last Shuriken), and threw the second Shuriken 2f earlier than before (was thought to be impossible to hit without correcting our position, but better RNG to determine the Shuriken path was enough). #23336620125877012 - Tenchu: Stealth Assassins WiP. Echigoya dead at 8433 (4f saved), synced. I think I’m done with the first stage now. #23227925003734882 - Tenchu: Stealth Assassins WiP. New hook shot after Katanal, Select+Up implemented, Echigoya synced. #23129487615744280 - Tenchu: Stealth Assassins WiP. Katanal dead at 6227f. AWDS Watch file for USA ROM. AWDS TAS bot by me and STL. …Probably only works on USA ROM. Saved 3 frames in the starting menus, lost 1 on purpose to Start stage 1 because loading times get shorter then. Re-TAS’d going to Katanal and saved 38 frames also thanks to the Up+Select trick. 16f improved on Katanal, 2 going to Echigoya. NK implemented my Up-Down-Square strategy for Katanal and saved 28 frames. 8 frames improvement to Katanal, improved some to Echigoya (badly), Shuriken strategy for Echigoya. Tenchu USA v1.0 any% first stage mid-boss improved 32 frames. Echigoya desynched, should synch on frame 7812. Tenchu USA v1.0 any% first stage clear (8864 Echigoya death cutscene).